These are the used, or perhaps we should call them "previously owned" hurdy-gurdies we have for sale. For these instruments that need restoration, the price shown is for the completely restored instrument. Just as we do for an instrument sent to us, we give the buyer a complete listing of the work that needs to be done. Essentially the buyer purchases the unrestored instrument and then commissions us to restore it. For more information about our restoration services and on buying a used instrument, see our services page. This beautiful little luteback was completed in 2006 for a local HG player. It has exquisite tone and beautiful construction. The soundboard is top quality hand-picked Sitka spruce. The back is flamed (tiger-striped) maple with purpleheart divider strips. It has the classic 6 strings of a French style instrument. It is in perfect condition. 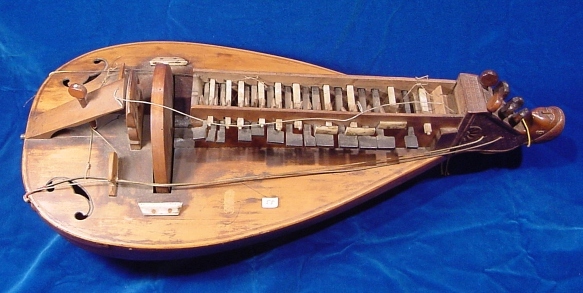 The body is based on a luteback hurdy-gurdy built by Colson á Mirecourt in the early or mid 19th century. The Colson shop (pere et fils) made very few lutebacks, and we were very excited to have one available to measure and draw plans from. The instrument is a little shorter, less deep and less broad than the classic Jenzat style, making it ideal for a player who is looking for a smaller instrument. It's decorated with abalone shell and with purpleheart trim pieces and binding. The purpleheart has been treated with a UV stablizer to extend its color, maintaining its rich purple hue. The peghead, keybox top, cover and tailpiece are all decorated with exquisite, dainty Celtic knotwork motifs. All turned pieces (tuning pegs, tirant peg, strap buttons) were hand-made specifically for this instrument. It has hidden Pegheds® tuning machines with custom purpleheart heads. It also includes a very small display tuner on the back of the instrument, perfect for checking tuning easily and unobtrusively. 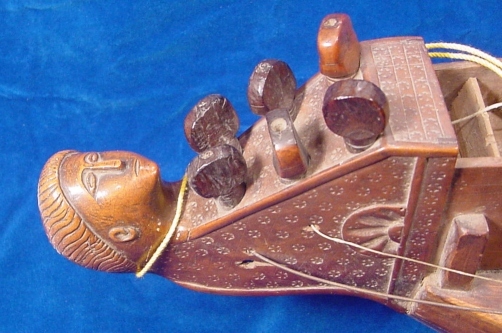 Patrick Bouffard himself played this instrument in concert at the Over the Water Hurdy-gurdy Festival, and the inside of the keybox top bears his inscription and signature. It comes complete in a soft case with a strap, cotton, rosin, spare parts, and the instructional setup DVD. The price is $6750. Please look on our Facebook page for more photos of this lovely instrument. This instrument is awaiting restoration. It is unsigned with no label inside the body, and the keybox top, crank, and wheel cover are missing. The soundboard is spruce, and appears to be of good quality. A previous owner apparently attempted to give it a makeover by removing part of the finish. The restored instrument will be completely refinished. This is a great chance to get into a French luteback at a bargain price. Please contact us if you would like to purchase the unrestored instrument.